Today, November 14, is World Diabetes Day. This is not a day of celebration, but a day of remembrance for all that we've experienced as people with diabetes and all that we hope for in the future. World Diabetes Day is also a day to remember that there are far too many people with diabetes in this world that do not have access to the healthcare, medication and badic education that they so desperately need. That is why we're announcing that 10% of all diaVerge coaching and upcoming course sales will be donated to T1 International. The right to insulin. Everyone should have enough affordable insulin and syringes. The right to manage your blood sugar. Everyone should be able to test their blood sugar levels regularly. The right to diabetes education. Everyone should be able to understand their condition, including adjusting insulin dosages and diet. The right to healthcare. Everyone should have hospital care in the case of emergencies and ongoing specialist care from a professional who understands type 1 diabetes. The right to live a life free from discrimination. No one should be subject to any form of discrimination or prejudice because they have type 1 diabetes. In addition, ANOTHER 10% of diaVerge sales will be donated to Faustman Lab research at Massachusetts General Hospital in the USA. Faustman Lab is currently conducting a phase II clinical trial testing the ability of the generic vaccine bacillus Calmette-Guérin (BCG) to reverse advanced type 1 diabetes and other autoimmune diseases, including Crohn's disease, lupus, scleroderma, rheumatoid arthritis, Sjögren's syndrome, and multiple sclerosis. Positive results from the Phase I study were reported in 2012. 20% of TOTAL coaching and course sales (not just profit) will go to these programs. diaVerge.com was born from the need to give back to our diabetes community and help people through the struggles that they're facing with diabetes management. Last year, we launched personalized coaching services. In early 2018 we're launching online training courses to help more people both locally and around the world. It was very difficult to choose two charities for our 2018 donations but we feel confident that both T1International and Faustman Lab have great potential in their respective markets to improve the lives of people with diabetes. Thank you for your support of diaVerge.com over the last few years. We wouldn't be here without you. I look forward to offering more and helping more, all the while remembering those in need. 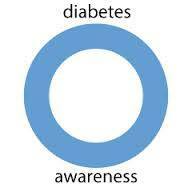 Please spread awareness this World Diabetes Day. Talk to others about diabetes. Tell your story on Facebook or Instagram. Post a video to YouTube. Educate. Inform. It's not always easy to step out and be noticed but we have the ability to give a face and voice to this often invisible disease. Thank your ongoing support of diaVerge.com. We're in this together!